The Princely-Ducal House of Gold Ferrari has the Royal Patronage of the Sovereign Imperial and Royal House of Rurikovich. He is also the Honorary President of the Canadian Nobility Association. For his involvements in worldwide charity work he was chosen “Ambassador of Goodwill” for SPMUDA International. Academically he is holding 9 Doctorate or Post doctorate degrees in Philosophy, Theology, Marketing, Civil Law, International Economics, Business Administration and History, is an Honorary Professor and Dean for 3 Universities, and was honored so far with 10 Honorary Doctorates from various Universities and Institutions from USA, Brazil, Italy, France and Spain. H.E. Sir Matthias Friedrich Bork, Dr.hc mult. 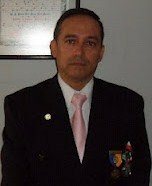 Secretary and Personal Assistant to His Highness Duke Javier Otto Gold Ferrari Ph.D.